The chipmunks are at it again – bringing mayhem, music and adventure in their latest movie “Alvin and the Chipmunks: Chipwrecked” with the returning cast Jason Lee as Dave Seville, David Cross as Ian with the voices of Justin Long, Matthew Gray Gubler, Jesse McCartney, Anna Faris, Christina Applegate and Amy Poehler. On their first encounter, Theodore mistakes Zoe for a monster. But soon finds out that the monster is a young woman whose island pals include ‘Spalding,’ ‘Calloway,’ ‘Rawlings’, ‘Dunlop’ and ‘Nerf -- respectively, a basketball, golf ball, baseball, tennis ball, and nerf football. She enjoys extended chats with her anthropomorphized sports gear, all of whom have faces presumably drawn by Zoe. The inadvertent discovery of some long-buried treasure adds to the dynamic – and danger – between Zoe and the Chipmunks/Chipettes. “I was really impressed by the scale of the production. When I walked onto the set, my heart beat faster because it reminded me of those classic family movies, like ‘Swiss Family Robinson.’ And the story – domesticated, fancy chipmunks being stranded on a crazy, mysterious island! It’s eternally exciting!” Slate shares. 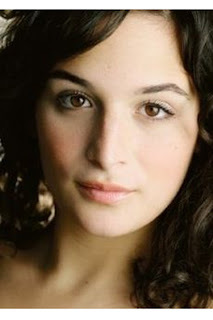 Jenny Slate is a former cast member of Saturday Night Live. In 2009, Jenny presented her one-lady show, Jenny Slate: Dead Millionaire, to sold-out audiences in New York and Los Angeles, and revived it at UCB in 2010. Last season, Jenny joined the Saturday Night Live cast as featured performer and created such memorable characters like “Tina Tina,” the doorbell saleslady. Before joining SNL, Jenny was cast in the HBO comedy series “Bored to Death,” as Stella, the stoner girlfriend to Jason Schwartzman. Jenny will soon be seen in “This Means War” with Reese Witherspoon, Tom Hardy and Chris Pine to be released by Twentieth Century Fox. “Alvin and the Chipmunks: Chipwrecked” opens January 8 from 20th Century Fox to be distributed by Warner Bros. nationwide.